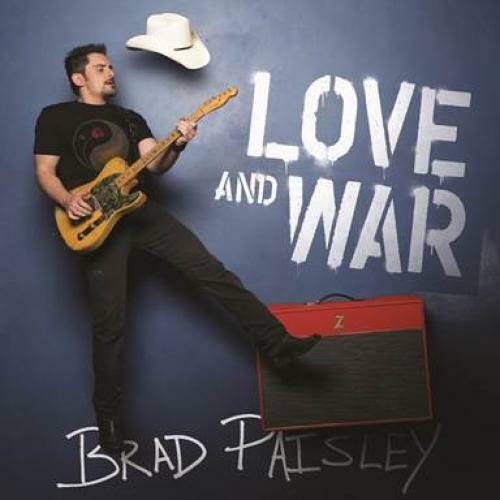 LOVE AND WAR, the newest album from country music superstar Brad Paisley will be released April 21st. This week, "Today," the first single from the much anticipated album, enters the Top 5 on the country airplay charts. Fans can download "Today" HERE and stream it HERE. Brad Paisley is a critically acclaimed singer, songwriter, guitarist and entertainer whose talents have earned him numerous awards, including three GRAMMYs, two American Music Awards, 14 Academy of Country Music Awards and 14 Country Music Association Awards (including Entertainer of the Year), among many others. He has been a proud member of the Grand Ole Opry since 2001. Paisley has written 20 of his 23 #1 hits including "He Didn't Have to Be," "Mud on the Tires," "She's Everything," "Water" and "Remind Me," among others. His highly successful Life Amplified World Tour 2016 traveled across the US and Canada and is continuing through February 2017. His current single, "Today," is resonating with people around the globe and is currently in the Top 5 on the country single charts and the music video has been viewed over 30 million times. Paisley has partnered with Boot Barn(r) and developed an exclusive line of jeans, hats, T-shirts, jewelry, belts and woven shirts called Moonshine Spirit by Brad Paisley. Connect with Brad at BradPaisley.com, Facebook.com/BradPaisley, on Twitter @BradPaisley, on Instagram @Brad Paisley, and YouTube at YouTube.com/BradPaisley.